This illustrated inventory highlights a small collection of nineteenth-century photographs of Native Americans. The collection was compiled as a resource decades ago, long before the creation of the Society’s online catalog, and represents just a fraction of the resources documenting Native people in AAS collections. Information on other holdings can be found on the Resources page. This inventory includes many studio portraits of Native Americans and views of their homes and surroundings. Most were intended for non-Native audiences and were reproduced in government reports, illustrated newspapers or mounted on stereo cards. People from the Sioux, Creek, Crow and Arapaho tribes, as well as many others, are identified. When known, both English and native names of individuals and tribal affiliations have been included in the descriptions. Many terms used in the entries for this inventory are inscribed or printed on the photographs themselves. Some of these terms may now be considered to be culturally insensitive. To learn more about this topic, researchers can visit the resources page of the Association of Tribal Archives, Libraries & Museums. Many of the photographs in this collection were included in W.H. 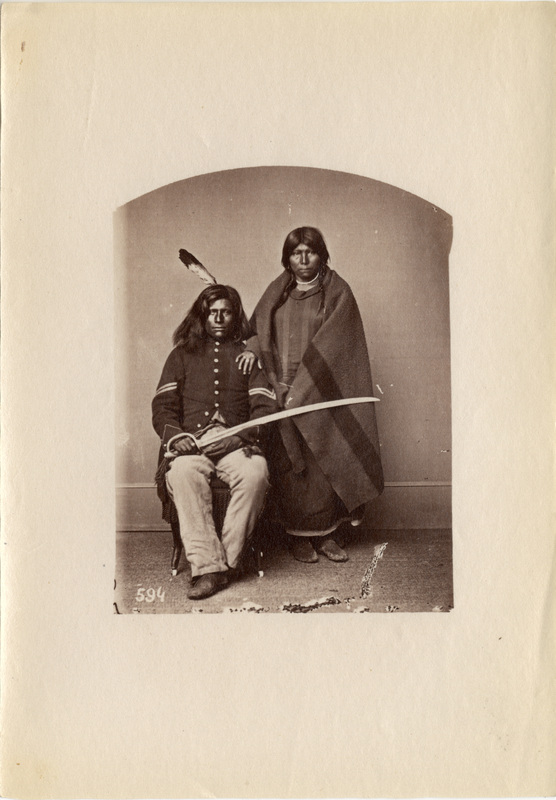 Jackson's Descriptive catalogue of photographs of North American Indians (1877). As part of the U.S. Geological and Geographical Survey, William Henry Jackson documented Native Americans in the west. The collection also includes photos from Thompson and Powell's series U.S. Topographical and Geological Survey of the Colorado River of the West. In 1870, John Wesley Powell and Almon Harris Thompson set out to survey the lands and peoples of the Colorado River Valley. Other notable photographers whose images are included in this collection are Eadweard Muybridge, Elias O. Beaman, John N. Choate and Arthur French. Note: Titles of images are taken from the images themselves, unless otherwise noted. Subject tags used for each item are constructed by a cataloger or taken from the Library of Congress subject headings as of Spring 2018.